Greenpoint is as close as it comes to a Polish enclave in New York City, and Karczma epitomizes the neighborhood’s traditional flavor in earthy dishes like pierogies and stuffed cabbage. 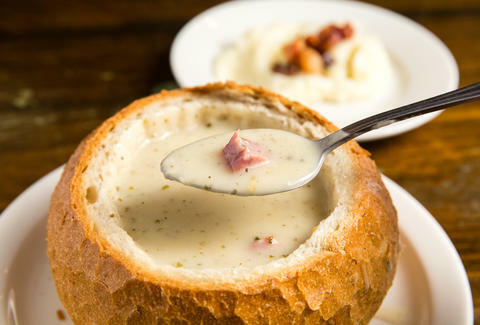 But the absolute best item on the heavy menu is also the best value: the white borscht soup -- served hot in a bread bowl accompanied by a plate of mashed potatoes topped with fatty pork -- costs just $5.50. The white borscht soup is billed as an appetizer, but do not underestimate it. Made with soured flour and served warm, it’s rich and creamy, with a pepper- and herb-flecked base thick enough to buoy the generous chunks of smoked kielbasa, hard-boiled egg, and boiled potato floating within. The hearty mixture comes in a bread bowl that puts Panera’s to shame: The rustic hollowed-out loaf, capped with a crusty lid, makes for a vessel that dwarfs its fast-casual counterpart in size and flavor. After the liquid is gone, the soaked-through bowl is soft, salty, and almost as filling as the soup you came for. It’s hard to be hungry afterwards, but the accompanying plate of velvety mashed potatoes sprinkled with crisped cubes of pork belly proves hard to deny. Despite the peasant-style fare at peasant-purse prices, the spot is no hole-in-the-wall. Decked out in warm barnyard wood, distressed wagon wheels, and wall-mounted scythes, Karczma looks and feels like a themed restaurant... except, a themed restaurant that happens to have authentic food. Waitresses in dirndls complete the Disney-fied effect, with thick accents to match, all adding to the escapist charm. A life-size prop well in the middle of the dining room, looking plucked from an Eastern European farmscape, doesn’t draw from an underground stream of beer, but you’d think it did: German and Polish suds here flow liberally into giant glasses fit for feudal lords. If there's one thing that can make winter winds and G train delays almost tolerable, it’s sitting down to hot soup and oversized beer in Little Poland. Billy Frierson is an Associate Staff Writer at Thrillist, who used to roll white bread up into little balls over cartoons as a kid. He now prefers bread bowls. Follow him on Twitter and Instagram.